I bought a Big Easy a while back. It is one of my favorite “grills” by far. It doesn’t get any easier – marinate/brine/whatever meat you wish to cook and put it into the cooker. Turkeys and chickens take about 10 minutes per pound. A family pack of wings takes about 30 minutes. Done. No mess, no fuss. It’s a beautiful thing. And nothing is like roasted chicken on the Char-Broil Big Easy. Garlic, dill and rosemary give this chicken a nice savory flavor. This is my go-to recipe for roasting chicken. I do not brine the birds or marinate them. I slather them (you can easily fit two decent-sized chickens into the Big Easy) with the mixture below and put them into the cooker. The skin comes up super crispy and the entire bird is moist and tender and flavorful. Also try my easy roasted turkey cooked on the Big Easy. Rinse the bird and pat dry. Mix remaining ingredients. Note: You may want to add more dill or rosemary. Taste the mixture and add more as you need. Slather mixture all over and inside the bird. You can refrigerate for up to 12 hours before cooking. I've found that marinating isn't necessary. Place into a heated Big Easy (or onto a grill) and cook until meat in the thighs hits 185 F and the breasts hit 160 F.
Let rest 30 minutes before carving (if you can resist it that long!). To make gravy from the drippings, add the drippings to the broth in a small pan and bring to a boil. Reduce to a simmer. Slowly whisk in the flour and stir until thickened. 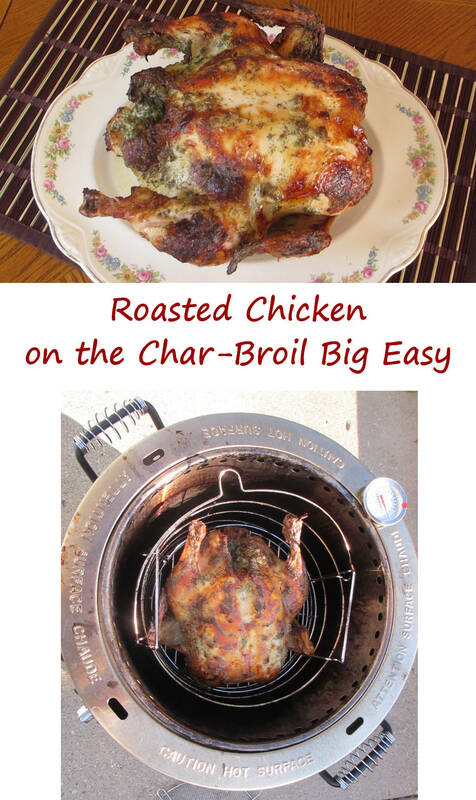 This entry was posted in From the Char-Broil The Big Easy™, From the Grill & Smoker, Main Dishes and tagged big easy, Big Easy roasted chicken, char-broil, fryer, garlic rosemary roasted chicken, oil-less, recipe, Roasted Chicken on the Char-Broil Big Easy by Mike. Bookmark the permalink. What heat setting on the Big Easy do you use to roast your chickens? I’ve been trying to roast some, but they always just end up incinerated on the outside and uncooked on the inside. Hi Karen. I use the older model Big Easy which has only one heat setting. I believe the newer one has two. I always use a wireless thermometer to keep an eye on the temps though. You might want to check yours often until you get a feel for the cooking time. Do you have the older or newer model Big Easy? I have several of the older ones, and the cover (basically a wire lid) results in a nice crispy skin, but you do have to watch it. I usually only put it on towards the end of the cook. I have a new model big easy and roasting the chicken is not near as easy as so many make it out to be. I keep getting incinerated skin on the outside and raw chicken inside!!! Tried varying the temperatures, grill lid on, off, on again off again. Then I sometimes get chicken looking great on top and raw on the bottom… So, then I tried elevating the bird some but then it seemed like it was going to take forever to cook. So I turned the temperature to the higher setting and oops, another black bird! I’d like to know what the older model temperature is. I have an oven thermometer and maybe I can try figuring out what setting to put mine on. Help. I’m frustrated. Hi Lisa. That’s rather odd. I don’t have the newer model, but I was under the impression that the two models aren’t that different other than you have a ‘hi/lo’ temp and I just have ‘on’. I will test my cooker’s internal temp next time I fire up to see what it cooks at but I seem to recall it was around 400 F. Don’t quote me on that yet. When you have birds that are overcooking do you rub anything on the outsides of the chicken that might cause that? I’ve had great success cooking chicken my Big Easy, so maybe something weird is going on here. I have the new Big Easy and cooking the chicken in there was very easy! Season the chicken, heated the big easy to high, placed the chicken on the grill turned down the heat to low and covered in about an hour the chicken was done nice and juicy!!! Also made a Tri Tip with fresh garlic came out perfect in about an hour!!! Have you ever stacked your chicken? 3 small ones? Have you used the big easy in cold weather? Hi Karen. I’ve never tried stacking whole chickens. I guess you could in the Bunk Bed baskets, but it’d be tight. I have had multiple levels of chicken pieces cooking at once though, with great success, using the Bunk Beds. Cold weather hasn’t been really a problem for me with the Big Easy. Wind, though, can be challenging. I always have the top on when cooking in the wind, it seems to help keep the heat in. Cook times usually increase anyways, though. I also have a newer model and having similar struggles as some of you. Wondering if the lower temp will work so I don’t pull out a burnt bird that is still bloody in the legs/thighs. I would like to know this also. I’ve been tempted to get the SRG (Smoker Roaster Grill) model but have not yet. Lower temps might help since it sounds like the outside is getting done a lot quicker.